“What’re they like?” I asked my brother when he returned, on the eve of our departure, from the pre-trip meeting. I would be going along on this river trip in the capacity of yoga teacher. Poor bipolar kid, I thought. Must be in a manic phase. We set out boating. As usual on rafting trips, all the family’s dirty laundry immediately came out. The father’s mother believed that her daughter-in-law disliked her, and confided in everyone about this, sometimes tearfully. All the family dynamics in the bigger boats made you want to get in a smaller one. Mike, the older son, seemed to have an excess of energy. “Who wants to go in the ducky with me? Who wants to go in the ducky with me?” he kept asking. 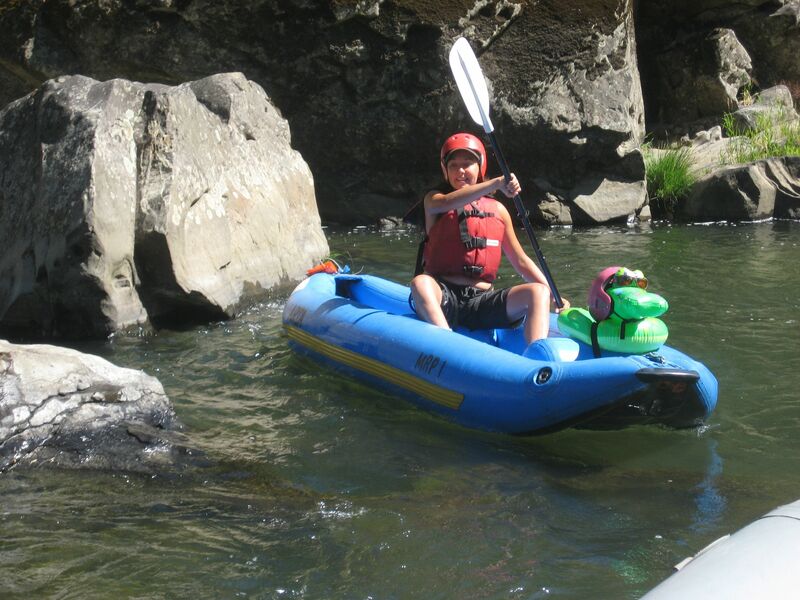 A ducky is a blue inflatable kayak in which one or two people can paddle independently in moderately-sized rapids. I was feeling antsy myself. I volunteered to go in the double ducky with the restless youth. Mike had tied several bandanas together and wound them around his arms in an unusual pattern. That’s a bit zany, I thought. Maybe it’s like a special ritual on his basketball team or something. He was super-psyched but there wasn’t really much in the way of whitewater that afternoon. I tried to make things interesting for him. “Hey, Mike, want to Zen boat?” I asked. Zen boating is when you don’t paddle. “BACKWARDS ZEN BOAT!” I yelled, turning us around and raising my paddle over my head. Mike imitated. We happily backwards Zen boated all the way to camp. In camp that night Mike told a long and convoluted story about a girlfriend he’d had who could fit a quarter in her bellybutton. It didn’t sound true but was very compelling. The younger son sat quietly reading Harry Potter. Poor bipolar kid, I thought. Now he’s probably tired from his meds. Mike made a sort of patty-shaped burger out of some chicken from dinner and some berries he picked and insisted on cooking it. The guides obliged. What an unusual and creative energy he had, I thought. The next morning, Mike attended half of my yoga class, then bolted abruptly in the middle. Can’t expect to hold the attention of a teenager, I thought. This was the day of the trip that began with a long stretch of Class III rapids called Mule Creek Canyon leading up to the hardest rapid, Blossom Bar. Blossom Bar was always causing trouble. Sometimes boats would flip in there. The guides took the duckies through the first part and then gave them back to the guests for the second part. It was a whole production, eddying out so the guides could scout, then getting kind of tense as the guides took first the duckies through, then the gear boats and paddleboats with the rest of the passengers. When it was over there was a relieved exhale over lunch. I had never gotten to ducky Mule Creek Canyon because usually the guests wanted to do it and filled up all the ducky spots. But today there was an empty spot in Mike’s double ducky. “I’m gonna ducky Mule Creek with Mike,” I told my brother. “If you’re sure that’s what you want to do…” he said. “If it’s cool with you,” said my brother. Why was he being so weird about me duckying Mule Creek Canyon? Did he think it was beyond me? I could totally do it. This was a genius plan. I’d have all that teenaged athlete muscle for power and I could just steer. “Left of the Jaws, right of the first hole, right of the second hole, paddle through the Coffeepot,” I repeated. “Got that?” I looked over at Mike. “I just told you what to do,” I said. We got into the ducky and started paddling. Mike was whooping before we even got into the current. “Left!” I shouted. “LEFT!” But he was not obeying my paddle commands. Now we were in the canyon. The first hole was visibly roiling as promised. “GO RIGHT!” I shouted, but Mike paddled the wrong way. Maybe he didn’t understand the difference between which side you wanted to paddle on versus which way you wanted to go. “PADDLE ON THE LEFT,” I yelled. But we went straight into the hole and the boat flipped. Fortunately, we were both still right next to the boat. It was in between us. We flipped it back over and then reached across, clasped each other’s forearms and flung ourselves back in. “THAT WAS AMAZING!” shouted Mike. He was pumped. It was then and only then that I realized that he was the bipolar kid, and I was poised above the most dangerous rapid of the river in a boat with him and his far superior strength. “You have to do what I tell you!” I said. “I DON’T DO WHAT ANYONE TELLS ME!” He laughed manically. That was disturbing, because very soon I was going to tell him to eddy out above Blossom Bar and if he didn’t do that, he’d paddle us right into a dangerous rapid that I did not know how to paddle on my own. It killed people, though only rarely, and only obese people without life jackets, I thought. But I had once seen it tear open the shin of a guide from knee to ankle after she flipped her ducky in it. I did not want to go into this rapid with a bonafide maniac. I did not want to go into this rapid at all. I quickly formulated a plan. If he continued to ignore me, I would grab his paddle out of his hands, throw it in the river and paddle alone. How would a bipolar eighteen-year-old respond to this, I wondered? How ironic, I thought, that I had wanted to harness what I thought was a superior strength and now was becoming imperiled by exactly that strength. I should become more self-reliant and learn to trust myself above all others. “YOU HAVE TO STOP MESSING AROUND RIGHT NOW AND DO EXACTLY WHAT I TELL YOU,” I said in my angriest and most authoritative voice. Would this work? Good thing there’s some bi- in that bipolar, I thought. We paddled into the eddy and the guides took the duckies through without incident. We walked around the hardest part and got back into our duckies. Mike then disobeyed my every paddle command for the rest of our ride, but this luckily this had no greater consequence other than getting us stuck on a few rocks. After lunch, I speedboated ahead with another guide, Sam. (Speedboating is when a guide takes a lone boat ahead of the rest of the fleet to claim a choice campsite for the night.) When we got to camp I popped the top on a much-needed beer and gulped it. “So, Mike is the bipolar kid,” I said finally. I didn’t really know how to explain my arbitrary and mistaken conclusions about sanity without delving into the history of my romantic life. “I’ve never been very good at spotting the crazy ones,” I frowned. Like many people diagnosed as madmen, Mike nevertheless spoke a lot of truth. That night, he overheard me telling someone about the book I was writing. On the last day of the trip, I duckied alone. I strapped an inflatable green pool toy to the front of my ducky and put a helmet on its head. I named the pool toy Little Green and spent the morning singing the entirety of Joni Mitchell’s album Blue to her. Singing Blue was a private tradition I had for the final stretch of river. Sometimes I sang it alone and sometimes women of a certain age paddled alongside me and we did duets. Today it was just Little Green and I. I told the pool toy all about the meaning the different songs on Blue had in my life. Now who was the mad(wo)man? After the last of the rapids, as we came to what I knew to be the final long, boring stretch of flatwater, I tried to sell my ducky to another willing taker. Mike, predictably, volunteered. “Will you take Little Green safely to the end?” I asked. A little while later, when we nosed up to the boat ramp, I hopped out of the gear boat, dragged the ducky up on shore with Mike still in it, and opened all its valves and Little Green’s as well. Everything began to deflate with a hiss, and the trip was over. “Thanks for bringing Little Green to the end,” I said, pulling Mike to his feet. “That’s what I said I would do,” he said, perhaps a tad defensively. When Mike and I hugged goodbye, I felt the cords of muscle that had both paddled us into a hole and then pulled me back into the boat. Strength, I had learned, was subject to will. Raw power was useless, even dangerous, if not properly harnessed or controlled. I had learned this lesson many times, but the river had once again clarified things. Mike released me, squinted, jutted out his chin. “Do your thing,” he said.